A New Way to Shave: Bikini Soft Smooth Shave Oil. Shaving is such a pain, isn't it? I am embarrassed to admit that I have to shave every day. Whether it is my under arms, my legs or bikini area, I pull out the razor and shave each and every day. Shaving is not a chore that I take lightly. I do not want to cut up my skin. I demand soft and smooth skin at all times. I look for products that work, and make shaving fast and easy for me. My latest discovery is Bikini Soft Smooth Shave Oil. Bikini Soft Smooth Shave Oil not only makes shaving fast and easy for me, it helps keep my skin soft and smooth because of the oil formula that helps my razor glide right over my skin. This shave oil is a lubricant that reduces all forms of irritation such as razor burn, nicks, and cuts. It is the perfect mixture of natural oils, rich moisturizers and skin softeners that do the trick. Shaving has never been so easy. It works both in and out of the shower, and like I said, makes shaving easier than ever for me. Bikini Soft Snooth Shave Oil sells for $12.99 at bikinisoft.com. Be Fearlessly Fresh with Secret Mean Stinks. Last year I told you about this amazing stand against bullying from Secret called Mean Stinks. This year, they are taking it a bit further with a larger campaign, a new product and some really fun ways to get involved to take a stand against bullying. The latest U.S. Department of Justice report shows 30% of female students grades 6 – 12 were bullied at school or cyberbullied during the 2009 – 2010 school year, and Mean Stinks is committed to being part of the solution. Secret wants to help bring an end to girl-to-girl bullying by inspiring girls to “gang up” around acts of good. As I talked about last year, kids are mean, girls in particular. I don't think a week goes by that I don't witness this horrific behavior happening, either right in front of me or on the internet. With so many things like Twitter, Facebook and Instagram, there is so much "mean" in front of me all the time. Simply put, we need to change our thoughts and behavior. Secret is helping lead the way. Not only do they want to get the message across, they have taken one of their great products, Clinical Strength Deodorant, and made a new version for Mean Stinks. Secret Mean Stinks gives us a Clinical Strength product to help protect against the ‘stink’ caused by wetness and odor, while providing a way to ‘stick-up’ against what really stinks – BEING MEAN. Secret will be donating $1 (up to $150,000) from the purchases of this new Mean Stinks Clinical Strength sold to Girls on the Run®, to fund their girl empowerment programming and help prevent mean behavior before it starts. A super easy and fun way to get involved and bring awareness to the problem and the campaign is to take the Mean Stinks Pinky Swear. To take the Pinky Swear, just paint your pinky nail blue in a show of peace & solidarity to keep mean out of your group of friends before heading back to school. I have been wearing mine and everyone asks me about it. Already, a few of my friends are now sporting blue pinky nails too. To find out even more and get involved in the Secret Mean Stinks campaign, join them over on the Mean Stinks Facebook page. You can get Fearlessly Fresh right now on the P&G e-store or at your favorite drugstore starting next month. 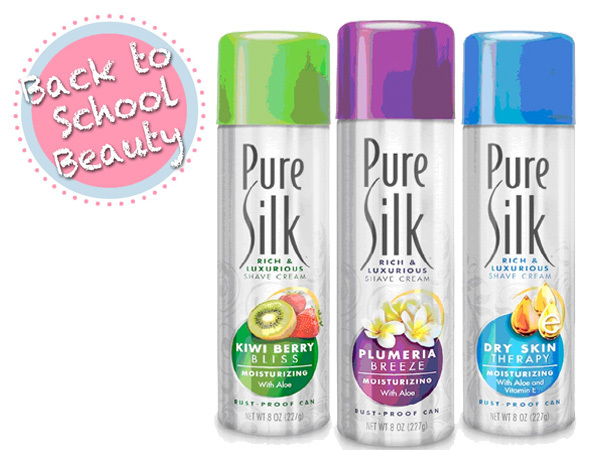 Back to School Beauty: Shave with Pure Silk Shave Cream. I know getting back into the school swing of things takes time. It is a busy time of year. No matter how busy you are, don’t let your shaving routine "fall" by the wayside! Make sure you keep your shower stocked with the essentials, such as shaving cream. One of my favorites is Pure Silk Moisturizing Shave Cream. Once the cooler weather sets in and bikinis and dresses are traded for pants and sweaters, it’s tempting to skip a shave here and there. But it’s important to shave year-round, especially the bikini line! Shaving the bikini line with Pure Silk on a regular basis helps to form a microscopic layer of calloused skin, which helps prevent irritation from shaving. Come summertime – or that much-anticipated winter vacation – this calloused layer will help keep away those unsightly red bumps that can appear when skin becomes irritated after a prolonged period without shaving. Keep it smooth by simply purchasing at drugstores and mass retailer nationwide where it sells for under $2.00.